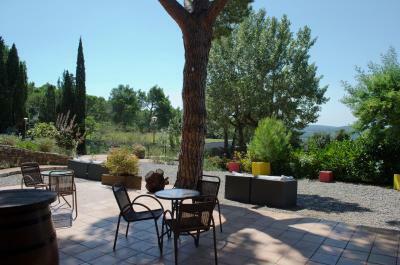 Lock in a great price for Mas Ses Vinyes – rated 8.6 by recent guests! Bed and terrace were wonderful. Restaurant had amazing food, but was expensive. Peace and tranquility, fantastic room and overall a calm and relaxing ambiance in a serene setting out of the hustle and bustle. Great staff as well all added to and excellent stay. It is our second visit which speaks for itself. The house has a beautiful view from the first floor and a gorgeous pool. The restaurant is great and a short 10 minutes drive takes you to the sea or to the medieval towns around. Excellent hotel in an excellent location. Thank you to all staff for making us so welcome . The location of the place is amazing. 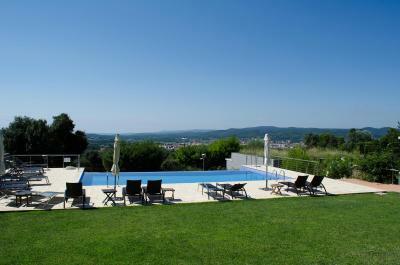 It has a great swimming pool and is sorrounded by nature. The restaurant is really good although a little bit expensive (30-40 euros per person) but it is quite famous since a lot of people go to the place to eat in it. The room was amazing, with a great bath that could easily fit two people. 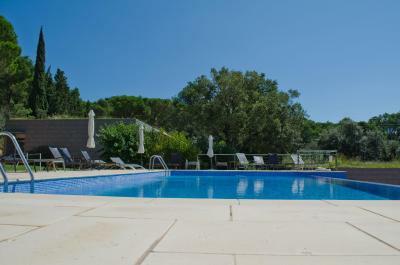 Great spot with excellent staff and a lovely pool. We will return. A lovely location but you need a car as it would be a hot and dusty walk into town and take you well over an hour on foot. The location suited us as we didn't want to be in the midst of a town or beach resort. We stayed in the old house part of the hotel and it was very clean and comfortable and we had a little terrace to sit out on. The bed was large and comfortable. What staff there were seemed friendly and helpful although they left at 23h. The restaurant is wonderful. It's very, very unusual to find a hotel restaurant with the menu range and quality of food and service such that one is totally happy to eat there every night (of 7). The rooms and public facilities including the pool are top class. 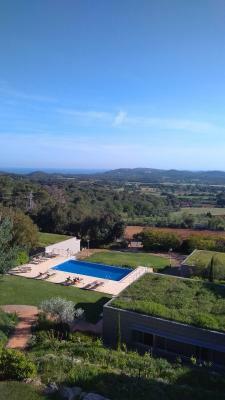 The area of Spain it is in is extremely attractive and the nearby town of Begur is absolutely beautiful. 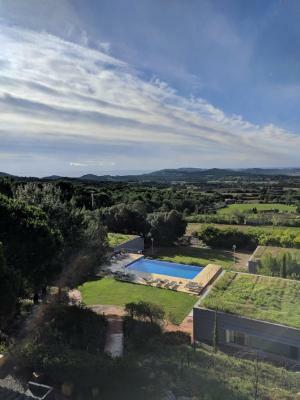 Mas Ses Vinyes This rating is a reflection of how the property compares to the industry standard when it comes to price, facilities and services available. It's based on a self-evaluation by the property. Use this rating to help choose your stay! 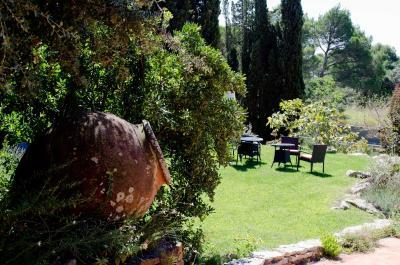 One of our top picks in Begur.This charming hotel has a peaceful setting near Begur, surrounded by forest. 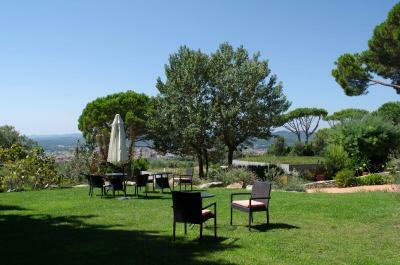 Mas Ses Vinyes offers a spa (extra cost), an outdoor pool and a terrace with beautiful views. The hotel’s spa center includes a hydromassage bath, a cold water pool, a Finnish sauna and a Hammam. Entry is subject to an additional cost. Rooms all have free Wi-Fi access, spacious bathrooms and a balcony. Some rooms are in the old farmhouse building and some are in the new annex, by the swimming pool. 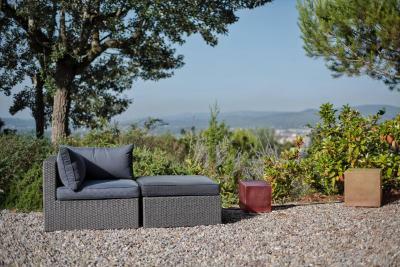 Mas Ses Vinyes offers views over Calella de Palafrugell and the Mediterranean Sea. 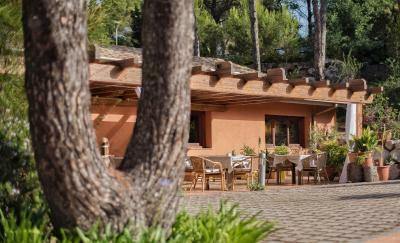 The hotel restaurant serves Mediterranean dishes and fine Empordà wines. Parking is available for free. 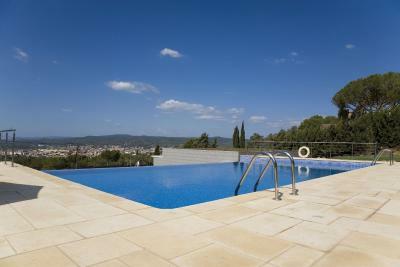 The center of Begur, the beach and the bays of Calella and Tamariu are all within a short drive. 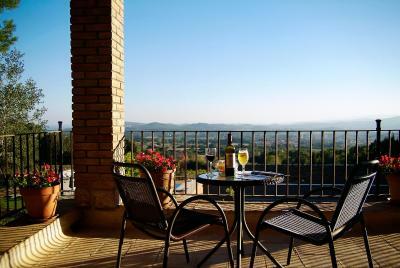 When would you like to stay at Mas Ses Vinyes? 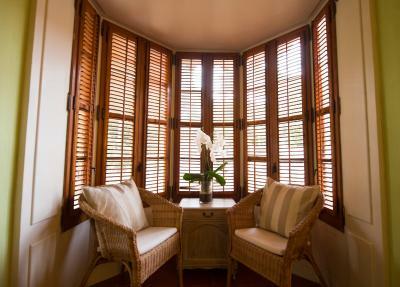 Set in the modern building, around the swimming pool, this air-conditioned room has direct access to the hotel garden. It comes with a TV, mini-bar and a private terrace. It has either 2 single beds or 1 double bed. This traditional, individually styled room is located in the old farmhouse building. It has 1 double bed. Extra beds and baby cots are not available in this room type. Please note that there is no mini-bar available in this room type. This double room features a tile/marble floor, air conditioning, and 1 spa access per stay. The bathroom comes with free toiletries, bath or shower, and hairdryer. This twin/double room has mini-bar, air conditioning, and 1 spa access per stay. The bathroom comes with free toiletries, shower, and hairdryer. This double room features air conditioning and heating. The bathroom comes with a shower or bath tub and free toiletries. A telephone and free WiFi is provided. Please note this room has an extra cleaning fee and change of sheets. House Rules Mas Ses Vinyes takes special requests – add in the next step! Mas Ses Vinyes accepts these cards and reserves the right to temporarily hold an amount prior to arrival. SPA has an additional cost of 20 € per person an hour of private and exclusive circuit, please check availability before your arrival at the hotel. The restaurant is a la carte please contact property to reserve a table. No refrigerator or ice machine available in main building. Paper thin walls. For this rate I did expect at least a fridge and a bit more space in the room. The blue room was the last available and is very simple. The bathroom is enormous, though. Biggest problem were the walls: paper thin. The restaurant is audible until midnight and everyone walking through the hallway could very well be inside the room. Since it isin the middle of the countryside, you can easily find bugs in your room. We had a small problem with ants because we left some food unattended in the room. Another counterpart is that you need a car if you are going to stay in this place, since it is not within walking distance of any beach/town. We arrived about 16.30 having been travelling for a few hours and so decided to have dinner in the restaurant on our first night. Bearing in mind the fairly isolated location, it would have been nice to have had a pre-dinner drink or cup of coffee or tea or just a glass of water in the lovely grounds which had lots of seating areas with nice views. However, at 19.00 we were told the bar didn't open until 20.15p.m. when dinner service started and there were no facilities in the room or hotel itself. We drove into town instead that night. We tried the restaurant on the second night and it was nice but, despite having had some lovely meals in the nearby towns, it was the most expensive meal we had whilst in the area - and we had to ask for the wine menu having sat there for 20 minutes studying the food menu. The hotel itself was faultless. However, it is relatively remote and a car is necessary - so you have to face parking problems when going to town or beach. Reasonable welcome, but no help offered with cases. Room decor very grim, dark grey and burgundy, not a room to spend any time in. Breakfast choice mediocre, poorly presented. Dinner was extremely disappointing, frites were served stone cold, and vegetables were all coated in thick batter and deep fried, not appetising. The bedroom was small and there was no dressing or other table to put a laptop to work and furniture sub-standard for a four star hotel although the bathroom was more than adequate.